Cape Town has been the seat of Parliament for many years. Every year around about May all politicians pack their bags and households up and move to Cape Town for the parliamentary session. The Union buildings where most of the Ministers in government have their offices become deserted when the annual trek to Cape Town begins. Back in the 1960's things were done slightly differently than they are done today. In those days we had a President and a Prime Minister at the head of Government. The President being the ceremonial head and the Prime Minister the executive head. Today the two positions have been combined with the State President being the ceremonial and executive head of government. Back in 1969 when I was doing my military service in the State President's Guard, it was the tradition of the State President to travel by train from Pretoria to Cape Town for the opening of Parliament. When he left Pretoria a sending off parade was held at the Pretoria Station for him and his guard in ceremonial dress formed the guard of honour. The regiment wore a greenish colour uniform with gold braid down the legs of the trousers and on the front of the jackets, three gold coloured rings hanging from each shoulder and when on parade white gloves and a hard cap with an ostrich feather on the front of it. 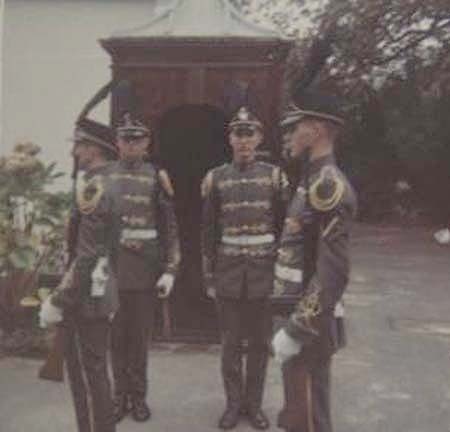 Once the president had boarded the train we (the State President's guard, about a 140 soldiers in all) were taken back to barracks to change out of our ceremonial dress into our regular brown uniforms. From there we were taken to a military airport in Pretoria where we boarded a plane and were flown to Cape Town. On arrival in Cape Town we were whisked from the airport to the Castle of Cape of Good Hopeto do a practice run for a parade which would be held on the arrival of the State President in Cape Town the following day. The route of this parade was from the Castle along Strand Street, down Adderley Street as far as the fountain circle and then to the side entrance of the station where the President's car would be waiting for him when he arrived the following evening. Of course today things are done slightly differently. The President has his own aeroplane and jets into Cape Town in time for the opening of Parliament. He also has his own guard but these days they don't have the feather on their caps like we had and they carry a different rifle to the one we used on parade. For the opening of Parliament many regiments are called up to line the streets of Cape Town to honour the State President as his motorcade drives up Adderley Street on his way to Parliament. The day however starts early for The State President guards. They have to be transported from their barracks to the Castle where they will form up before marching to Parliament to the beat of a military band, When they arrive in Parliament Street they are halted opposite to the entrance of Parliament to await the arrival of the President. When he arrives they are called to attention and then present arms which the President then acknowledges. After this the President enters parliament with the many dignatories who have gathered for the occasion to open parliament for the new session While the president is making his opening speech to parliament the guards are required to stand at ease outside. This can be quite traumatic for some as the cap you are wearing tends to bite into your forehead especially when there is a slight breeze blowing and you are wearing the feather on your cap. As you are not allowed to move during the wait for the president to finish his speech many soldiers simply faint as the blood drains from their heads. After standing at ease for about an hour the worst command is the call to attention. Your whole body has gone stiff and lifting the rifle to your shoulder can be rather scary as you have to have a solid grip on it when you lift it. For members of the State President's Guard the highlight of your time being a guard is the opening of Parliament Parade. Your photo appears in the newspaper and often the one who falls over on parade finds himself on the front page. What a way to hit the front pages! This year President Mbeki's speech was well received by most politicians and the public. He has set dates for certain basic services such as water and electricity to be delivered to rural areas where people are suffering. He has also put forward plans to employ more people in the building of infrastructure in the build up to the 2010 soccer world cup. All that now remains is to see how succesful he will be in implementing the plans.